Robert Leaver residence in the Los Angeles Examiner. 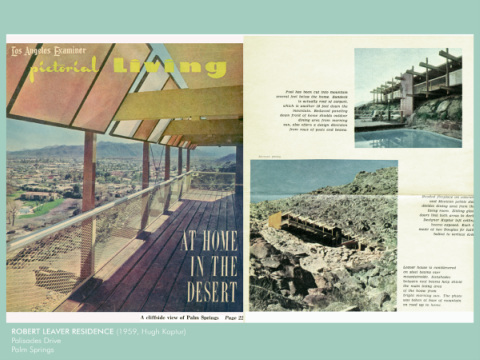 IN 1957, a young building designer, Hugh M. Kaptur, was hired by Los Angeles businessman Robert Leaver, to design a home in a spectacular hillside setting on Palisades Road overlooking downtown Palm Springs. The home, like its location, turned out to be a masterpiece and was featured in a Los Angeles Examiner Weekend edition. The Leavers passed on and the home was neglected for many years. There was a fire with significant damage and finally, the other homeowners on Palisades Road decided that the building had to be torn down. The steel beam foundation was still solid, and the space was turned into a neighborhood tennis court. 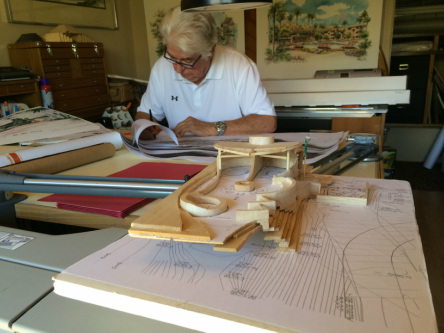 Architect Hugh M. Kaptur at work with a scale model of the new guest house. The tennis court eventually became a part of the lot that the Pete Siva house occupied - another Kaptur design. In 2014, the new owners of the Siva house decided that the only way to accommodate their out-of-town visitors was to build a guest house on the space now occupied by the unused tennis court. There was only one choice for an architect - Hugh M. Kaptur, now in his eighties, still designing innovative architecture that is the fabric of Palm Springs. Rarely in an architect's career does one get the chance to design two homes for the same location. Even more rare is the opportunity to design two homes fifty-seven years apart in the same spectacular cliff-side setting. Join us as we film the construction process in this documentary short film "Bookends". We'll interview the architect, the homeowners, the construction workers, the engineers and all those involved with making this amazing structure from the creative genius of Hugh M. Kaptur.